Our Leadership, Governance and People Management programmes have been designed with a primary focus on continued learning, reflective practice and careful stewardship of the self and organisations. Each of our academic staff are experienced in their respective fields and our innovative courses and flexible teaching methods strive to enhance the learning experience. Our strong links with businesses have allowed us to provide placements for our students with organisations such as VW, Nandos and HP. We also encourage our students to participate in challenges and competitions such as the IBM Business Challenge and the NIBS competition in Texas. Our proactive and practical approach to learning gives students the opportunity to negotiate in boardroom discussion or undertake recruitment interviews. We have also embedded mentoring opportunities into our programmes from employers and students. 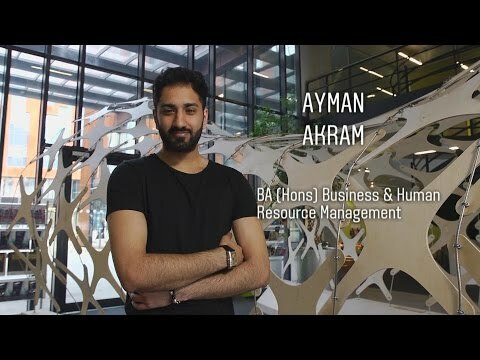 Student Ayman Akram talks about his experiences of the course. Our undergraduate HRM course is accredited to the CIPD’s intermediate diploma standards and our postgraduate diploma and masters in HRM are both accredited to the advanced diploma standards. The IoD (Institute of Directors) course is led from this subject area and staff also work for the Leadership Centre delivering bespoke in-company programmes and ILM (Institute of Leadership and Management) courses. "As an HR consultant, I was getting plenty of great experience, but I felt I needed something more to be able to progress my career to the next level. Bridging that gap was a big motivator for me. The knowledge I gained through studying has proved really useful in everything I’ve done since – from setting up my own HR consultancy to working in a specialised role with a global HR provider." "My tutors were so inspiring. I was able to tap into their knowledge and develop the skills to become a great leader and a successful coach. As a result, I've been able to influence the behaviours of the board and ultimately change the culture within the business, empowering employees to grow and stretch their abilities." "Leeds Business School offered me a dual degree in the same course, enabling me to get a professional (CIPD) and an academic degree together."